*Disclosure: I received a complimentary “Precious Moments I Love You To The Moon” in exchange for my review. All opinions are 100% my own. I am an affiliate for Precious Moments. Love is not something to be measured. How can you really measure love, especially unconditional love between a mother and her child? It’s impossible to do, but the “Precious Moments ‘I Love You To The Moon And Back’“ ornament helps me express my love to my child in a way that he can see every day. The “I Love You To The Moon And Back” is a beautiful hand painted porcelain ornament from “Precious Moments“. It is a reminder of the endless love between you and your loved one. It is the perfect gift for Valentine’s Day gift, Sweetest Day gift, anniversary gift or for any romantic occasion. I believe that it is intended for a romantic duo, but it was so sweet and symbolic of the night time conversation between my son and I that I just had to share it with him. It’s really the perfect gift to give to anyone you love with unconditional love. It is beautifully crafted and stands approximately 6.75 inches high. 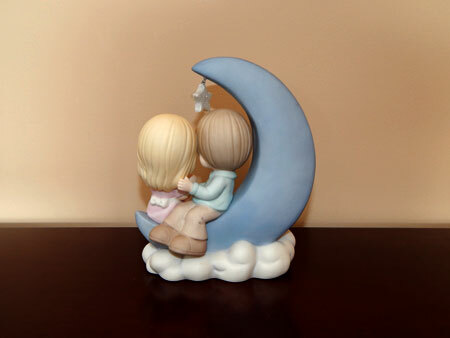 The colours are soft and the two characters have a familiar feel to them.They characters are sitting on the moon holding hands with a little star hanging over head. It is sculpted front and back, so it can be places at any angle and still looks beautiful. “Precious Moments“ always leaves me with a feeling of serenity. Growing up my Aunt always gave me a “Precious Moments“ ornament each Christmas, and I am delighted to be able to share them with my own children. The Garden Fairy Stake protects our summer flowerbed at the camper. The “I Love You To The Moon And Back” ornament is a daily reminder to my son about how much I love him. He has this placed in his room by his bed and it is one of the last things he sees each night as he closes his eye. “Precious Moments“ make beautiful gifts for any occasion. Valentine’s Day is tomorrow and it’s not to late to pick that perfect gift for your special valentine. Why not consider something from “Precious Moments“? You can find them online and at many of your favourite retailers!